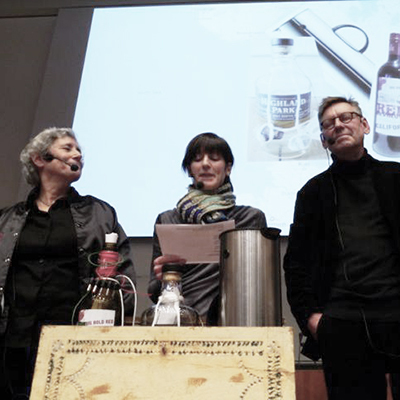 This book chapter began as a performance keynote at 4S/EASST 2012 annual conference in Copenhagen. Lucy Suchman, Pelle Ehn, and myself were asked to consider the conference theme ‘Design and Displacement: Social Studies of Science and Technology’ and how that might be situated in different places around the world. (Inspired by the Orkney Mailboats project). In this conversation, the Future Archaeologist (Laura Watts), the Anthropologist of Technoscience (Lucy Suchman) and the Collective Designer (Pelle Ehn) reflect on our different versions of ‘design’ and its futures from our research in the Orkney islands, Silicon Valley, and in Sweden. The original performance has been maintained as an online recording, featuring the original messages sent between each location, all our imagery, and copious photographs from the performance. I am excited to say that the performance has now been published as the Prologue to the new book Making Futures: Marginal Notes on Innovation, Design, and Democracy edited by Pelle Ehn, Elisabet M. Nilsson and Richard Topgaard, and published by MIT Press. The book is published under Creative Commons license, and you can read it direct from the publisher below. Watts, L., Pelle Ehn, Lucy Suchman (2014) Prologue, in Making Futures: Marginal Notes on Innovation, Design, and Democracy. Editors Pelle Ehn, Elisabet M. Nilsson, Richard Topgaard. Cambridge MA, MIT Press.